For many years, Paul Lynde was best known for his role as Henry McAfee in Bye Bye Birdie (and singing the hit song "Kids"). He also brought his infectious laugh and sarcastic delivery to featured roles in Under the Yum Yum Tree, Son of Flubber, Send Me No Flowers, The Glass Bottom Boat and Rabbit Test, among others. While working in film, Lynde also made numerous appearances on television, including the eponymous Paul Lynde Show (cancelled after one season). He took his wild and flamboyant sense of humor to appearances on The Munsters, F-Troop, Gidget and I Dream of Jeannie before moving on to play Uncle Arthur on Bewitched. But it was his 1966 appearance on a new game show called The Hollywood Squares that propelled Lynde to his greatest notoriety - starting as one of the squares and eventually winning his place in the coveted center square. So significant was his presence that he won two Emmy Awards for his work. 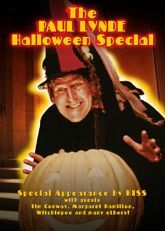 Paul also did a number of TV specials, but none attained the legendary status of The Paul Lynde Halloween Special. It aired only once (on October 29, 1976) and featured a Who's Who of mid-70's TV and film stars. Paul somehow held everything together as the ringmaster of a circus that featured Margaret Hamilton (in her only prime time TV appearance�and wearing her full outfit from Wizard of Oz), Witchie Poo from H.R. Pufnstuf, Tim Conway, Billy Barty, Betty White, and Donnie and Marie. What gives this program a special cache is that it features the first prime time TV appearance of KISS. Watch for their 3 songs�but stay for the on-stage conversation between KISS, Paul and Margaret Hamilton. It's is priceless!